The defense in Paul Manafort's Alexandria, VA trial on bank and tax fraud charges have rested their case - without calling a single witness to the stand, including Manafort. Prosecutors allege he dodged taxes on millions of dollars made from his work for a Ukrainian political party, then lied to obtain bank loans when cash stopped flowing from the project. The courtroom was sealed for around two hours Tuesday morning for an unknown reason, reopening around 11:30 a.m. with Manafort arriving around 10 minutes later. The decision to rest their case without calling any witnesses follows a denial by Judge T.S. Ellis III to acquit Manafort after his lawyers tried to argue that the special counsel had failed to prove its case at the federal trial. “I’m as surprised as you are,” Judge Ellis responded. Ellis then heard brief argument from both sides on the defense’s motion for acquittal, focusing primarily on four counts related to Federal Savings Bank. Prosecutor Uzo Asonye fired back, saying that that even if bank chairman Steve Calk overlooked Manafort’s financial woes, it would still be a crime to submit fraudulent documents to obtain the loans. Once that exchange was over, Manafort's team was afforded the opportunity to present their case, to which lead attorney Kevin Downing replied "The defense rests." 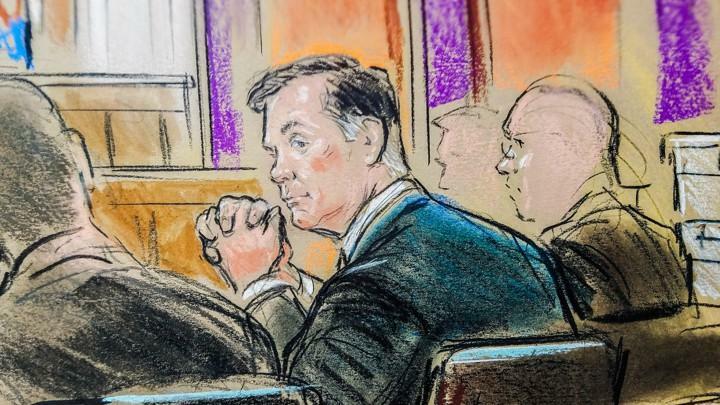 Ellis then began to question Manafort to ensure he was aware of the ramifications of that decision, to which the former Trump aide confirmed that he did not wish to take the witness stand. Had Manafort discussed the decision with his attorney? “I have, your honor,” Manafort responded, his voice clear. Was he satisfied with their advice? “I am, your honor,” Manafort replied. Had he decided whether he would testify? “I have decided,” Manafort said. “Do you wish to testify?” Ellis finally asked. And with that, Manafort returned to his seat.